Thank you to all of our members and volunteers for your help and input on developing the official comments of the East Bay Bicycle Coalition on the Draft Fremont Bicycle Master Plan. We received a lot of great ideas from enthusiastic EBBC members on the draft Plan, our members attended several meetings of the Fremont Bicycle Advocacy Meeting to review the plan, over 250 bicyclists responded to the City’s online web survey about the Plan, and the East Bay Bicycle Coalition hosted an advocacy ride in August to survey streets in Fremont for the potential to improve conditions for bicycling. On August 25, EBBC provided the following comments as our organization’s official response to the draft Bicycle Master Plan and look forward to the adoption and full implementation of the Plan. First, we commend the City of Fremont for installing as many bike lanes as they have to date and also in the Plan for including many more miles of bike lanes, which once installed will complete an extensive network of separated space for cyclists from cars. Of course, intersections still pose a major challenge to design for safe bicycle travel, and the speeds of traffic on Fremont Streets is way to high and posed a safety risk. For this reason, we feel that the Bicycle Master Plan could include a stronger traffic calming/traffic awareness element that is also part of the implementation plan. We also applaud the Plans inclusion of colored bike lanes for conflict zones. This roadway marking treatment is now approved in California and we strongly urge Fremont to start implementing colored bike lanes for all of the conflict zones of bicycle travel. Right turn lanes: the Plan’s designs for thru bike lanes and right turn lanes needs to be substantially improved. At these locations, the bike lane should be striped continuously, so that the motorist is required to drive over (or across) the bike lane. Such a movement will significantly increase the awareness of bicyclists. The current design of Figure 7-11 is too weak and needs upgrading. Also, colored bike lane treatment would significantly help. The Mission Boulevard undercrossing at the railroad tracks needs signage in addition to the proposed curb cuts. This stretch of roadway also needs some traffic calming elements to improve the safety of bicyclists. We applaud the City for the Plans inclusion of a multi-use pathway thru Central Park and extending south along the proposed BART right-of-way. This will be a highly used public facility and will also greatly increase the connectivity of the Fremont bicycle network. We applaud the Plans proposed bicycle signage. Oakland has taken the lead on this and it is great to see other cities following this lead and creating a more uniform signage system in the East Bay. We urge Fremont not to use Sharrows, without additional traffic calming/motorist awareness treatments that slow down traffic speeds to 25mph or less. One treatment we propose is the “super sharrow,” which Long Beach has spearheaded. This is a sharrow design with a wide green colored travel lane for cyclists. It has been a success in Long Beach and is approved provisionally in California. We applaud the Plan for encouraging the City of Fremont to develop a Complete Streets Policy. The region is discussing having such a requirement for its Block Grant Program. Thus, it makes sense for Fremont to have this policy in its own bicycle plan. We urge Fremont to conduct a feasibility study of completing a multiuse pathway along the BART right of way between Niles and the Fremont BART Station. This segment, once completed, will provide a direct connection from the North to Fremont BART and will also extend the East Bay Greenway south to the pathway along the southern BART right of way. Sequoia is a good connection between the Alameda Flood Control Pathway and Centerville. The Plan should include a tunnel under train tracks connecting to Centervile from the Alameda Flood Control Pathway. Blacow has great potential as a north-south bikeway for much of the length of the City. There needs to be bikeway connections between the frontage road segments, which provide a direct bikeway along the corridor, and this design needs to be on both sides of the street. A variety of cut-thrus for bikes and improved cross street crossing designs are also needed to complete this bikeway. We applaud the City of Fremont for addressing the porkchop problems at intersections. All porkchops need to be narrowed or eliminated, with bike lanes that are connected with dashed lines from the pork chops to the bike lanes extending away. The Peralta & Paseo Padre intersection needs a two-way bikeway from the Flood canal channel spur to this intersection, with either a box-turn treatment with advance bike box, or a bike signal head. Fremont Blvd needs bike lanes the entire length, including in Centerville (lose the center turn lanes). We applaud the Plan for including bike lanes on Fremont Blvd and strongly urge that these bike lanes be continuous and wide for safe bicycle travel. Warren Blvd needs it’s bike lanes fully and properly striped for its entire length. We realize this may be a Caltrans issue, but the City of Fremont should support improving these bike lanes. Buffered bike lanes are needed on high speed roadways, like Paseo padre and Thornton Ave. Where speeds exceep 35mph, separation of the bike lanes from high speed traffic is necessary for safe travel and to encourage more people to commute by bike. The NACTO Urban Bikeway Design Guide has many good recommendations for separated bikeways that other US cities are implementing at a rapid pace. We also urge you to improve the Implementation section of the Plan to include a more detail timeline for which projects are planned to be constructed during which years. We realize things change, but City staff need the support of a solid implementation plan in order to justify their workplans on bike projects and to allow the public to gauge how good a job staff are doing. In otherwords, it is very useful for the public to know which projects to expect construction on during the next 2-5 years, at least. Please improve the implementation section. Thank you very much for considering our comments and incorporating them into a revised final Fremont Bicycle Master Plan. Please do not hesitate to contact me with any questions you may have about this letter and the concerns and ideas we share herein. Bicycle Master Plan project sheets. BART right of way between Niles and the Fremont BART Station. and UPRR Tracks will be deleted. Kato Road, “E.” for Warren Avenue location will be deleted. based on balancing safety and traffic delay. constraints and opportunities in the construction of a grade separated crossing. make this a higher priority project. Parking at special events such as Festival of Arts will be added. Sunday, August 7, 10am-2:00pm. Meet at Fremont BART. 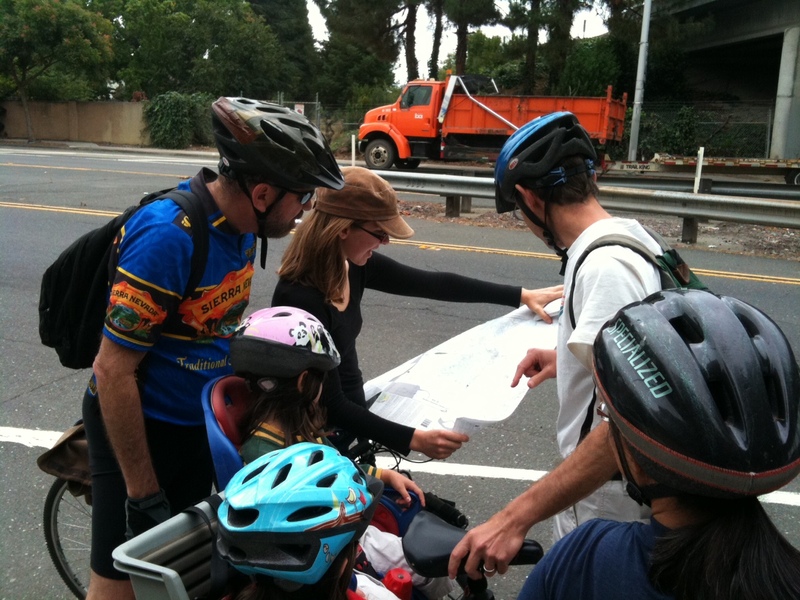 Interested cyclists are invited to join the East Bay Bicycle Coalition on a tour of potential bikeway improvements in Fremont. The ride will stop at several locations to discuss key bikeway improvements needed to make Fremont a better city for bicycling. Bring a lunch or plan to grab a bite to eat after the ride. safe bike crossings of I-880, particularly to the south for commuting to Silicon Valley. The Dixon Landing crossing of I-880 is the preferred crossing, but is extremely challenging and dangerous in its current configuration. Caltrans is reviewing this freeway intersection for potential improvements. For more info, contact Ina Gerhard. What’s are your top priorities? Add to this blog and the Bicycle Coalition will share your ideas with the city planners of Fremont. The purpose of the plan update is to identify community needs, identify new projects and determine program needs. The City wants you to share your thoughts! Your responses will help us plan for community needs. The survey will be open until March 14, 2011.